"What are the Twins television revenues?" "Why is everybody bitching about a $100 million payroll?" "Why couldn't the Twins sign Prince Fielder?" In Twins Territory, THE question has been: why did payroll go down $15 million following the second year of a publicly funded stadium? But because MLB teams keep their financial information so private, journalists are limited in the information they can dig up. Since that information doesn’t give the whole story - and because they want to share that information that they’ve uncovered - they find other questions so they can still publish the story. Or, they list what they found, and refer to it generally, but offer few specifics. My pithy intro might suggest I’m being critical of that strategy. I’m not - for two good reasons. First, because these are usually fine questions to answer, and every answer adds a piece to the puzzle. Second, because I‘m about to do much the same thing. 1) The Twins stretched payroll slightly last year, and so the reduction isn't really $15M over last year's budget. The last signing of last year's offseason was Carl Pavano, who signed for $8M. At the time, the Twins claimed they stretched a little to make that signing, and before that signing they were still looking into other players, albeit less expensive ones. So let's assume that accounts for $2-3M of the difference. 2) The Twins will need to pay more for draft picks then they did last year. Last year the Twins paid about $3M for their top draft picks. This year the Twins will have five picks in the top 75. Thanks to the new collective bargaining agreement, we know almost exactly how much those picks should cost: about $11M. That's $8M plus $2-3M from stretching last year and now the Twins are down ~$10-11M. We have $4-5M left to find. 3) Finally, St. Peter anticipates a drop in revenue. He clarified this a few minutes later when he said that revenues from the ballpark tend to normalize on a per capita basis. In other words, as the novelty of a new ballpark wears off, people spend less on each trip to the ballpark. That makes sense. Since payroll is supposed to be about 50% of the total revenue, a $4-5M decrease in payroll would reflect an $8-10M decrease in revenue. That seems high to me, but not totally unreasonable, especially when St. Peter added that they aren't budgeting for 3,000,000 in attendance this year. This shouldn't be meant to imply that I approve, or even completely understand. For instance, I still believe it is pennywise and pound foolish to not invest and additional $2M in backup plans at two especially questionable roster spots. And it isn't clear to me why some of that decrease isn't offset by increases in shared national revenues, which consistently increase for MLB teams. I still haven’t answered the question. But it gets us closer, and leads to some good news/bad news. The bad news is that the Pohlads are not the Ilitchs - they run a business as a business, and not as a charitable organization, no matter how much fun it would be to win a World Series. But it also implies that two of those three cuts should be one-time events. Hopefully so will this payroll reduction. Which may have been the real $15,000,000 question I wanted answered. My biggest concern that I'm not getting answered is what about the additional 15-30 million coming in from the new cable contract? What's happening to that? What Pohlad also mentioned that the Twins knew that they had several guys in the last year of their contracts. They anticipated Capps, Nathan, Cuddyer and Kubel coming off the payroll. They dumped Hardy because of his salary. But they could have dumped a bunch of other salary as well. They didn't. I am perfectly happy with the Pohlads running the Twins like a business. Tiger fans may be happy now, but in five years Ilitch may be dead and they will be cursing his legacy. John, what about the Twins new TV deal which is another $25m/yr in revenue? I don't know how anyone could be perfectly happy with the Pohlads running the Twins like a business - it pretty much guarantees we'll never be legitimate world series contenders as long as they run the team. Hard to be happy about that, I'd think. Accepting reality, yes. Happy about it? Come on. Good post, and I apppreciate the analysis in trying to account for that $15 million. I was always under the impression that the money for signing players -- whether through the draft or as international free agents -- was distinct from the money allocated to the major league payroll. In the end, I guess all the money really comes out of the Pohlads' pockets, but I don't think it's an entirely moot point. "I guess all the money really comes out of the Pohlads' pockets"
No, it comes out of fans' pockets. The Pohlads dont spend a dime of their own money. Not complaining, but fans need to know this distinction. Ilitch is probably dipping into his own coffers. Pohlads: never. Thanks for the correction, Sam. I just misspoke there. Believe me, having forked over thousands of dollars over the years for Twins tickets and merchandise, I know that it is the fans' money, and not the Pohlads', that finances the team! I just meant, more or less, that the money for MLB payroll, and for draft signings, probably comes out of the same fund, in the end, though I think the two should be treated independently. I don't think there is any one to one correspondence between spending money and fielding a championship team. The Cubs and Orioles have been spending money for years and have little to show for it. Atlanta is good example of a team that spends money and does a good job of player development. It works, but they don't have many championships to show for it. I think the Twins are trying to work things in such a way as to give themselves a decent chance to be competive every year. Last year they spent a little extra money hoping to give themselves an even better chance, without sacrificing the future too much. It didn't work. Now, I think it is harder to "steal" potentially good players from other teams like the Twins did a decade or so ago, when they aquired Santana, Mays, Lohse, Ortiz and others. So they are working harder on drafting, international scouting, and development. All of that is not necessarily cheap. Plus you have to be lucky to keep a study flow of talent coming up to the majors. During the 2000's the Twins seemed to add a competent starting pitcher nearly every year from their farm system. It is probably more bad luck than anything else, that guys like Hunt, Gibson, Bashore, or Wimmers aren't ready to help. Having one or two quality young guys either in the rotation or standing in the wings would make the TWins prospects look much better. One can certainly question the Twins judgment on specific moves, and I can see why many would like them to spend "just a little more money". Largely though, I think the Twins have a plan and tend to work it pretty well. It is possible to look ahead a couple of years and perhaps see the Twins plenty strong in good, young major league players. Of course, they will probably need a bit of luck as well. As other commenters have noted, the increased TV revenue is a factor that should be accounted for in your analysis. League revenue sharing is another factor. My understanding from reading elsewhere (can't remember where right now) is the Twins this year, based on last year's revenues/payroll, are now contributors to the revenue sharing pool rather than recipients of funds. As I recall that is a shift of something like $20 million. One thing that wont be coming down is Ticket prices. The Fans will still be paying the 6th highest Ticket price in Major League Baseball. Where did the extra revenue go from the price increase last year?? 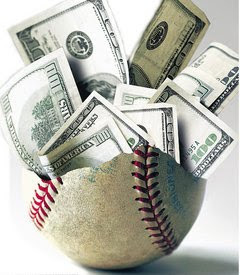 Fortune Magazine's annual analysis of MLB teams' revenues and other financials generally gets published near the end of March. Since I tend to believe the people who perform the analysis for Fortune are better at that kind of thing than I am, I usually consider their figures to be as accurate as anything publicly available. It will be interesting to see what Fortune shows for the Twins this year. I would rather have a team that is financed by it's own moneymaking ability in the marketplace than one dependent on the year-to-year benevolence/irrationality of the owners. I still always have trouble with that 50% of revenue statement. When you make $100 million and pay $50 million for player salaries, then you turnaround and make $200 million...what is that $100 million being spent on compared to the $50 million you previously spent -- more ushers, more ticket sellers (they don't sell tickets anymore, really -- it's all season ticket guys). More clean-up? Are minor league players getting more? If the Twins made $400 million, what would they spend $200 million on (beyond player salaries) that they didn't have for $50 back BEFORE Target Field. ""I guess all the money really comes out of the Pohlads' pockets"
No, it comes out of fans' pockets. The Pohlads dont spend a dime of their own money"
And whose pocket does your money come out of? Out of your employers pocket. So you actually "don't spend a dime of your own money" either I guess. Once you decide of your own free will to pay someone for something, your money is in their pocket and belongs to them. When they spend it is coming out of their pocket. By your reckoning, its Illitch's Caesar pizza customers who are paying Fielder's salary. A team that has sold over six million tickets the past two years and over two million before February 1st, is unwilling to spend a few more dollars on the leagues worst Bullpen. I agree with writerjoel. Everyone, including you, Twinsgeek, is way too willing to give the Twins a free pass for pocketing half of everything they take in, including taxpayer subsidies, instead of putting it back into the team. That is not okay with me, and shouldn't be an accepted given. If we pay a hundred million in taxes to support the team, why shouldn't that go into the team? In fact I'd rather see the 50% number go the other way: we'll put in 50% if the team puts in 50%. But that's not what we're getting; it's we'll put in 100%, you put in minus 50%. Screw that. "And whose pocket does your money come out of? Out of your employers pocket. So you actually "don't spend a dime of your own money" either I guess. Once you decide of your own free will to pay someone for something, your money is in their pocket and belongs to them. When they spend it is coming out of their pocket." This is the single dumbest statement I've ever read on a blog. What "free will" did you use to decide to pay a tax to build Target Field, particularly if you hate baseball, never attend a game at Target Field, had no interest in paying for Target Field, but happen to live in Hennipen County? I won't explain the difference in being paid to work vs. paying for entertainment because it will likely soar miles over your head. Baseball stadiums and teams aren't lemonade stands, dude. Reality isn't quite as simple as the 3rd-grade economics lesson you hilariously quoted. "I agree with writerjoel. Everyone, including you, Twinsgeek, is way too willing to give the Twins a free pass for pocketing half of everything they take in, including taxpayer subsidies, instead of putting it back into the team"
That's an inaccurate statement, no one has ever said they are pocketing the other 50%, that money goes into the organization as well, just not as player salaries. Charter Flights aren't free, neither are hotels for 81 games x 30 or so people etc., never mind scouting, Dominican baseball camps etc. Great comments. Just great. Thanks everyone. A couple of quick takes on some points. 1) I think the TV contract started a few years ago, so that increase was already built into last year's numbers. 2) Pohlad business vs charity. I generally side w business, but I find it silly to not stretch a little this year on another reliever and backup option for Morneau. 3) League revenue sharing. I agree there is a switch there, but I also think that started before this year, and thus has minimal impact on the change. 4) on 52% - First, I agree that it seems like that number covers more than just payroll (or is at least flexible) and that surprises me. Second, I think it's a fair point that as revenue doubled, perhaps that number should change upward. But I should point out that the team also has a loan to pay back for the stadium and revenue sharing to pay into, so that could eat up a fair amount of any increased percentage you think we should have.